More than 70% of eukaryotic genomes are transcribed into RNA transcripts, the majority of these transcripts are noncoding protein, and their biological functions are largely unknown. Over the last decade, the application of high-throughput sequencing technologies has led to the description of almost all cellular coding and noncoding RNA transcripts except perhaps for those transcripts that are lowly abundant or those present only in specific cells that are underrepresented in sampled tissue(s). An often underrepresented class of noncoding are long noncoding RNAs (lncRNAs), and these often play key regulatory functions for many biological processes such as cell identity and cell division. However, the purification and functional characterization in vitro are still a challenge in both animal and plant experimental systems. 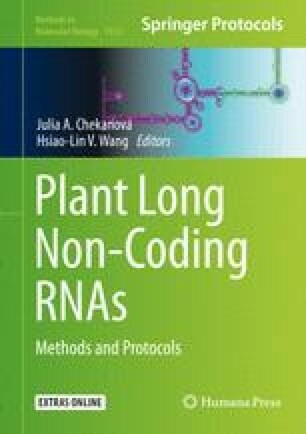 Here, we describe in detail methodology for purification of specific cell types, bioinformatic annotation of lncRNAs, and investigation of biological function using the reference plant Arabidopsis thaliana. This work was supported by an Australian Research Council Future Fellowship (FT130100525) awarded to IS and a MOET-VIED Ph.D. scholarship awarded to T.D.